Assassination of Abraham Lincoln - WHERE WERE THE BODYGUARDS? This image, by the the FBI, depicts the murder weapon which killed President Lincoln. The FBI tells us more about the gun: "The Booth Deringer (Specimen K1) was described as a single-shot, muzzle-loading, percussion cap-fired Deringer pistol manufactured by/for the Henry Deringer Company of Philadelphia, Pennsylvania. Its notable features and markings included, but were not limited to, a black walnut stock with checkering; a barrel with an octagonal upper portion and a round lower portion; an S-shaped triggerguard; a hammer; and scrollwork on the sideplates, buttplate, stock tip, wedgeplates, front sight, escutcheon, and flashplate." Crook, the President’s chief bodyguard, was off-duty. In his place, John F. Parker (who was late showing up for work that day) was responsible for the President’s safety. Accounts vary on Parker’s whereabouts at the precise moment Booth entered the State Box. Some say the President permitted him to take a better seat, thereby leaving Lincoln unguarded. Others say he was in a tavern across the street and wasn’t seen again until around 6 a.m. the next morning. 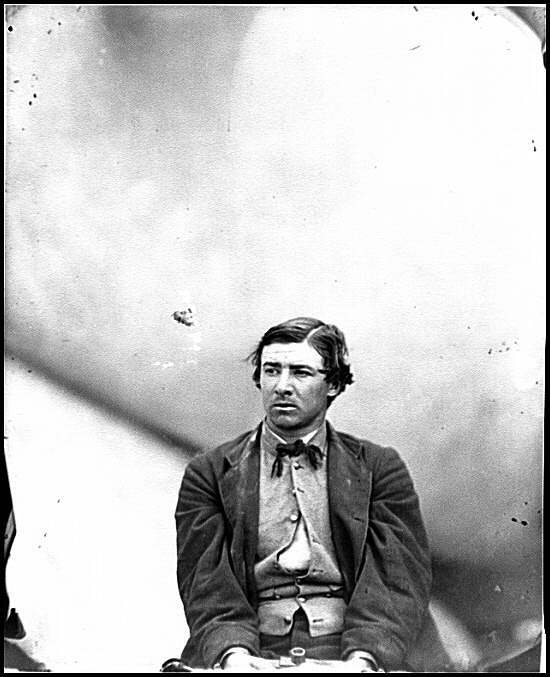 With no one around to stop him, Booth pulled out his pistol and fired one shot into the President’s head. The bullet (which was later removed in an autopsy) entered through his left ear and lodged behind his right eye. As the President slumped forward, perhaps grasping one of the flags draped in front of him, Major Rathbone struggled with Booth who, using his knife, slashed Rathbone’s arm. Booth jumped from the box, but the spur of his boot caught (and tore) a U.S. Treasury Guards flag. When he fell to the floor, he fractured his leg. It is said that Laura Keene rushed to the President's box with a pitcher of water. As the actress helped to care for the stricken President, his blood allegedly stained her cuff. Undaunted, Booth fled the theater through the back door and escaped on horseback. He crossed the "Eastern Branch" of the river, on the Navy Yard Bridge, about ten minutes ahead of fellow conspirator David E. Herold. With Washington, D.C. behind him, Booth was a wanted man. About 1,000 people were in Ford's Theater when he shot the President. The police blotter shows he was the only suspect police would try to find. Bos, Carole "WHERE WERE THE BODYGUARDS?" AwesomeStories.com. Mar 01, 2002. Apr 23, 2019. Could Lincoln’s Assassination Have Been Prevented?